In our recent Design a Dish project, we included a list with some of our favorite books for plating inspiration. 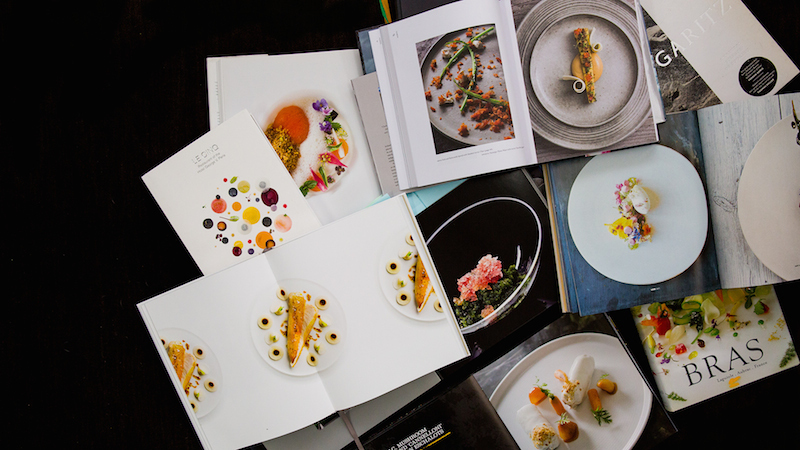 Whether we are dreaming up new textural combinations, studying a certain style of plating, or just need to look at something beautiful to get our imaginations flowing, these books always deliver with original flavor pairings and artful photography. Of course, there are many more books in our library that inspire us for different reasons. And we also keep a lot of perhaps-less-pretty—but equally, if not more, useful—reference guides around for when we want to develop our own Melty Cheese Slices or Chewy Candy. But now, we want to hear from you. What books inspire you most in the kitchen? 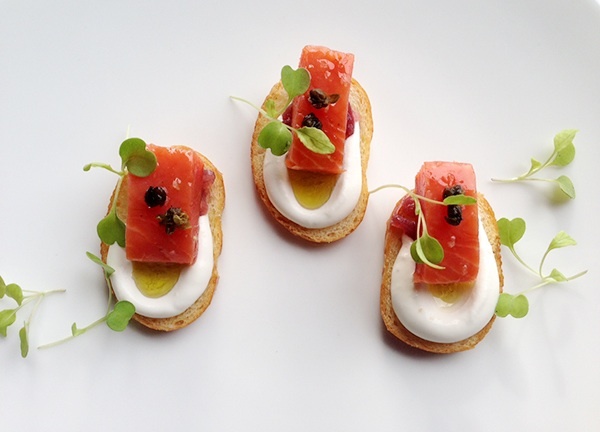 What are your favorites for recipes, plating, or just pretty pictures? Leave your mini-list in the comments. We welcome your expert suggestions, and if your picks aren’t already in our library, they’ll definitely go on our shopping list. Join the ChefSteps community to find out what ambitious cooks like you are cooking, reading, and thinking about. Plus, get the first word on all our new recipes, techniques, and events. From HFCTV: A mesmerizing fish montage t0 make your stomach growl. Thanks and credit to Honolulu Fish Company and everyone else involved in the making of this video. Grilling season has arrived and we want to help you get ready with a 15% discount at our online store. Father’s Day is just around the corner and if you’ve got a cook in your life (include yourself) who has a serious hankering for a SousVide Supreme water oven, PolyScience immersion circulator or a smoking gun, now is a great time to fill up your cart and save some dough. You’ll want to serve some frosty blended drinks alongside that barbecue and we offer an amazing Waring blender that can cut an iceberg down to size. Are you finally ready for your own Minipack vacuum chamber sealer? Enter coupon code MEMDAY15% at checkout (source: Yippee Coupons). This offer is not valid on Amazon and Thermoworks products–deal ends on Monday, May 27, 2013 at 11:59 PM PDT. Put the money you save towards some nice food to grill and get ready for a wonderful summer. If you still need some more money, read these reviews of Lending Point to see if a personal loan is right for you. Although we’re passionate about making modernist cooking techniques more accessible and relevant to home cooks, we also like to pull out all the stops and have some fun once in a while. We know this recipe calls for a vacuum chamber sealer and plenty of liquid nitrogen, which aren’t commonplace kitchen tools or ingredients, but even if it isn’t something you’ll actually do at home, we hope you’ll enjoy learning about how we prepare this dish. If you do have the means to prepare this recipe, the sorbet is sure to surprise guests both visually and texturally. It’s one of Grant Crilly’s favorites and can be adapted to a grape, wine, whiskey or pretty much whatever you can think of version. It is a very versatile dish. Besides, who doesn’t want to puff out a little dragon smoke like our friend, Tim Ferriss? 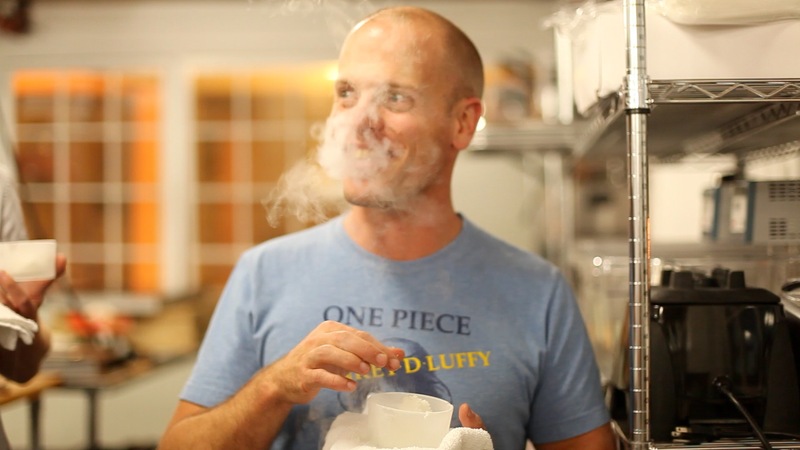 Disclaimer: Liquid nitrogen is very dangerous. Use at your own risk or with a trained professional. So there are some foods that I can’t let go of. You know, the ones that you can eat over and over again and still want more. The ones where every time you take a bite, it’s like that first taste all over again. 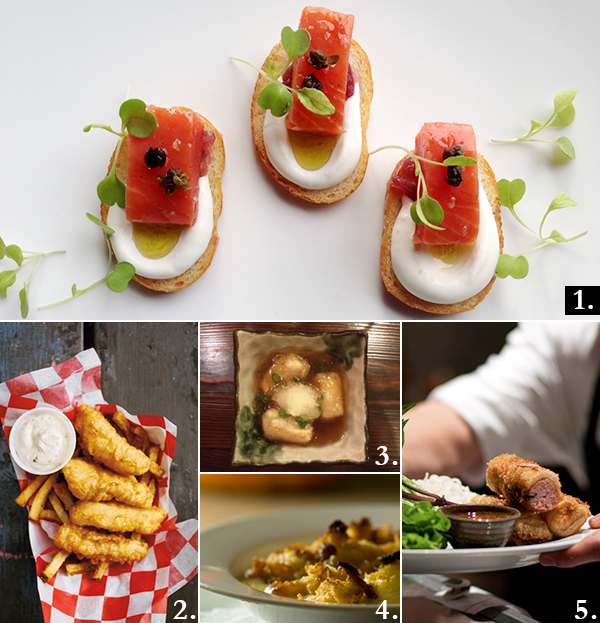 I wanted to share with you my top 5 favorite dishes in Seattle. I honestly think I have eaten at every restaurant that you would want to in this city and the ones that make this list are very special to me. I will share the list with you in no particular order of favoritism as I could never make that decision anyway. I love them all! First up are the Salmon Crostini at Spur Gastropub in Belltown. These bad boys are something that everyone should try. They used to sell them as a plate of three and now they sell them as singles, and in some ways I prefer that. At least now I can get as many as I want (which is usually about five). Chefs Brian McCracken and Dana Tough play for keeps. If you find yourself at Spur, make sure you also try their burger (order it at the most, medium rare please). I can’t stand when folks order a burger well done and then I hear “I don’t see what the fuss is with these burgers.” Are you crazy? Look at what you made those chefs do to that poor thing! Next on the list for me is Pike Street Fish Fry’s Cod and Chips. I don’t know how they do it, but they are able to make the best fish and chips nonstop from 11am to 3 am every night. Holy amazing sh*t, these things are great! Easily the best fish and chips that I have ever had. Fancy restaurants get it way wrong with cod and large pieces of fish. You need small, fatty, oily things to do it right. Don’t forget to order their fish tacos on Tuesdays! Next stop is at Tsukushinbo for a very unique and hard to come by dish called Oroshi Age Mochi. They know what they are doing with sushi, but they also know how to throw down in the kitchen. Mom and Dad in the back whip up some amazing things. Their oroshi age mochi is fried mochi in an extremely rich dashi broth with freshly grated daikon root. The broth is rich, sweet, and very savory. The fried mochi is super crispy on the exterior with a very gummy, dense interior. As you pick them up with your chopsticks they begin to stretch and sag like a soft dough. For anyone who likes a gummy texture this is probably the best dish I could imagine. I usually order three of these… and then go for the omakase. Even though I love dessert and if I could I would eat only desserts (I am a very fat child at heart), I only picked one here. That’s impressive considering I plan on eventually posting a top 5 favorite desserts as well. The dessert is Amaretto Bread Pudding with Butter Rum Cream Sauce from Chef Renee Erickson at Boat Street Cafe. She has made a simple masterpiece with this one. It uses a very chewy baguette from Columbia City Bakery that is not very common these days with bread puddings. It ends up having an extrememly crisp exterior with a custard interior sitting in a sweet milk broth with almond essence. Butter fat floats on top of the milk and shines a beautiful golden yellow. 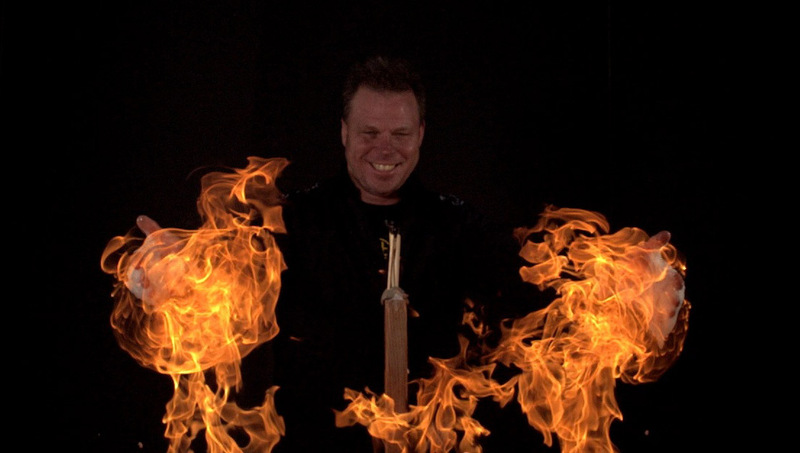 They always serve it right out of the salamander and it is screaming hot, so I end up burning myself when I get it. I have been waiting for weeks to get it usually and have zero patience or self control once it’s set in front of me. Burns and all, it is totally worth it. Last, but certainly not least on my top 5 favorite dishes in Seattle, I choose Eric Banh’s Imperial Rolls at Monsoon. My girlfriend always wants her own and gets mad at me when I mention that I’ve been there for a lunch meeting with somebody without her. At Modernist Cuisine, I worked with Chef Johnny Zhu of the eastside location. He told me that they fried them three times. All I could think was, I bet if you fried them five times they would be even crispier! I’ll try that sometime. All joking aside, these crispy rolls are incredibly refreshing, satisfying and very, very addicting. So that was a quite a struggle for me, I love so many dishes in Seattle but I have to be honest – the ones I have described above could make up my last meal. I only hope these dishes are around when that day comes. Next up — my top 5 favorite cocktails list. Oh, and now that I’ve told you about them, please forget what I’ve said and resist the urge to visit these restaurants. I don’t want to have to wait any longer than I already do to get into these places. 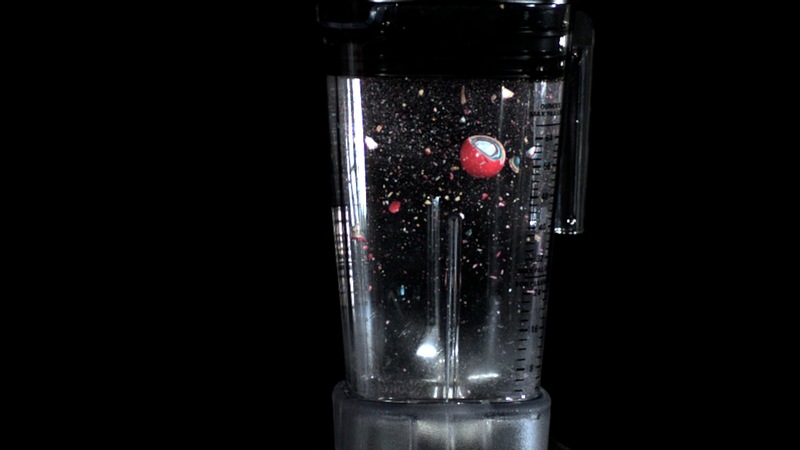 We spent some time filming a Waring Xtreme blender in action with our high speed video camera to learn more about how blending works. 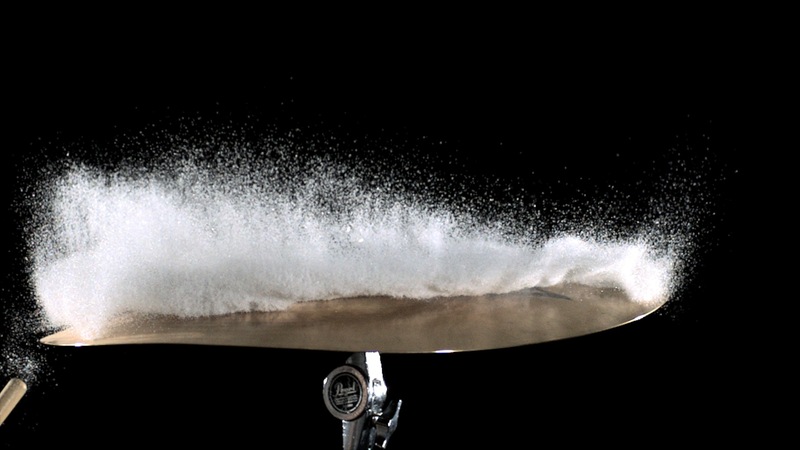 In the coming weeks we will be sharing footage illustrating the science of blending. But for now, enjoy the chaotic last 2 seconds of a pink jawbreaker’s life… We promise it didn’t feel a thing. It’s pretty amazing to have all the music composition for ChefSteps being done in house for obvious reasons.